AN APPEAL FOR information about a missing woman is to be made today, just days before the 15th anniversary of her disappearance. Crimestoppers is to make a renewed appeal to the public for information on the disappearance of Deirdre Jacob, who went missing from Newbridge in 1998. Her parents are expected to speak at a photocall today alongside the Irish Crimestoppers Trust at Naas Garda Station in Co Kildare. Sunday 28 July will mark the 15th anniversary of Deirdre’s disappearance. On that date in 1998, Jacob left her home and went to Newbridge to visit her grandmother. After this, she went to the AIB bank and then the Post Office in the town, before going back to her grandmother. Then she set out on the walk home. Her house was 25 minutes from her home and Jacob was last seen at around 3.30pm at the gateway to her house. The trainee teacher never made it to her home and has not been seen since. Irish Crimestoppers Trust was set up in 1998 to provide a confidential means for every citizen to report crime, without fear of recrimination, by calling a free phone confidential number: 1800 25 00 25. 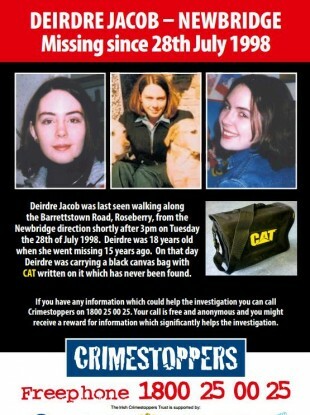 Email “Appeal on 15th anniversary of Deirdre Jacob's disappearance”. Feedback on “Appeal on 15th anniversary of Deirdre Jacob's disappearance”.